ALT OSC is an OSC※ application. This application is a specialized multi touch input device with simple operation.Its been designed for use in different purposes and in various situations, e.g. making music, performances, and installations. The power of this app is not limited to audio but also for providing visual as well as program control. 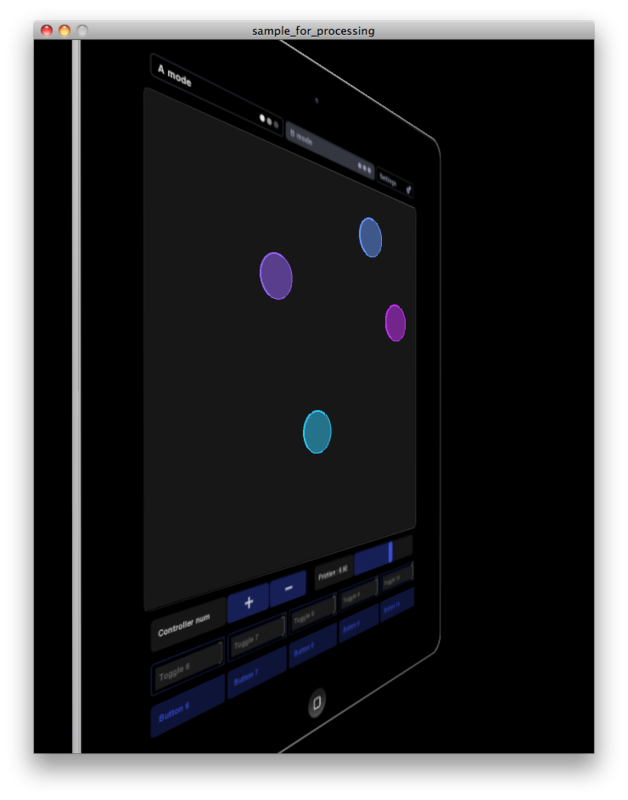 The clean and simple interface provides an intuitive interaction with multi touch. Program has characteristic control from simulate of friction and bounce movement of the ball. You can choose between two modes according to your needs. The ball will appear on the coordinates that you have touched. You can control the balls movements and the time until they disappear through settings of friction and duration. And you can also recieve the degree of transparency which as OSC value. This mode is for touch control. You choose the number of balls, and control each balls coordinates. The maximum number of balls is ten(for iPhone, iPod touch up to five). You can add or remove balls by using the "+/-" button. In this mode the balls don't disappear. It is for ranging or mixing control. In each mode the balls speed can be controlled by setting friction. Connect the computer and iOS device that you would like to use in network. You start ALT OSC, and open the setting page. Then you enter the IP address and port number of the computer that is connected. Enter the same port number in ALT OSC on your computer. Confirm that the connection is complete by moving each controller. They should move synchronically. And then, set the parameters for each controller as you like. 1 ~ 10 1 ~ 6 0. ~ 1. 0. ~ 1. 0 | 1 0 | 1 0. ~ 1. top | bottom | lefty | right 0. ~ 1. 1 ~ 10 1 ~ 6 0. ~ 1. 0. ~ 1. 0 | 1 top | bottom | left | right 0. ~ 1. -1. ~ 1. -1. ~ 1. -1. ~ 1. In order to prevent inadvertent operation, we recommend that you set to turn off Multitasking Gestures from the general menu (" Settings > General > Multitasking Gestures"). Yotaro Shuto and NOEL-KIT started DUB-Russell since end of 2010. They perform electric music based on improvisation with softwares they built. In March 2012, 2nd EP “Prank Poles” released by +MUS label. Electronic Musician. Versed in Digital sound processing, as well as a Max/MSP specialist. Released first album "Silent Reverb" in 2011, and in 2012 released the mini album "PERC EP from Hz-records. While building a cutting-edge sound by making full use of his own software he has also created a world that is both warm and poetic. This rare balance has been collecting a lot of attention. Run this order to connect ALT OSC to MIDI Bridge. Confirm the Port number is correct in OSC IN panel in the upper right corner of the window, and that the Active box is checked. When the controller of ALT OSC is operated, both of the lamps of OSC IN and the MIDI OUT panel light up. Set the port of the receiving software to "from MIDI Bridge 1" too, and confirm MIDI is received. Confirm receive of MIDI in receiving software with operating ALT OSC. Using the Active box of the OSC IN panel (ON/OFF function of receiving OSC) and the ASSIGN button of each control panel (individual MIDI transmitting function) the parameter mapping is easy. You can save the setting information to an external file if you wish to use it again later. When you start of application, "default.json" is read in the same location as MIDI Bridge. * For Windows user. 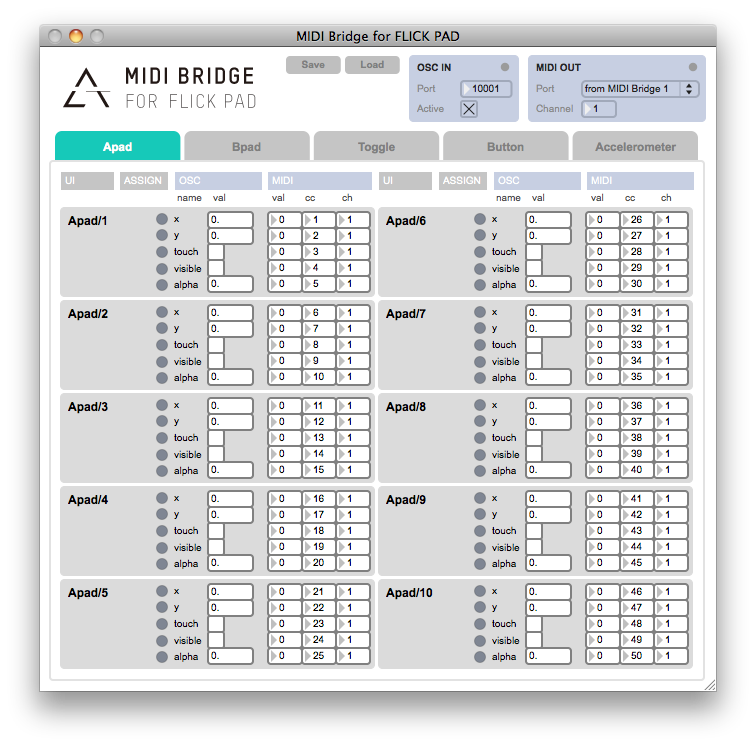 In order to use "MIDI Bridge for FLICK PAD", you need to install "MIDI Yoke". This sample shows how to control ALT OSC 3D model in detail. In order to run this sample, you need "oscP5", the OSC library for Processing (developed by Andreas Schlegel). Used in A mode, X represents the position of playback time, and Y represents the grain size. Also, by reading the information of the accelerometer and standing the iPhone/iPad vertically, the randomness parameter located on the play time will change. 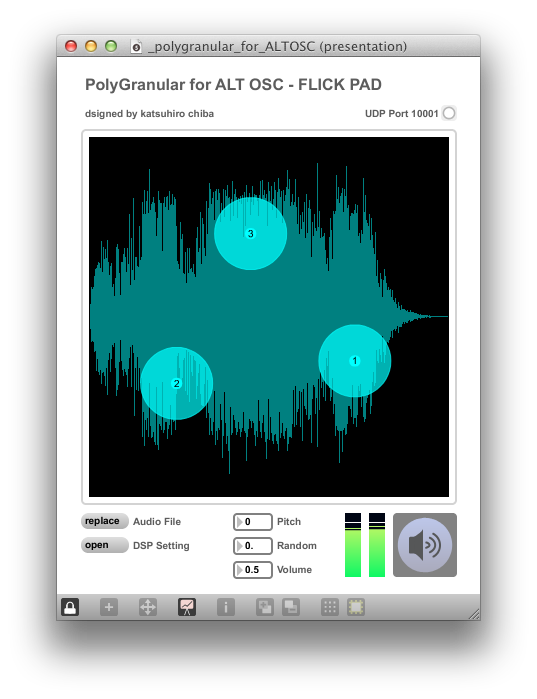 You may read the audio file by clicking the replace button on the bottom of the screen or drag-and-drop to the center of the waveform display area. Buttons 1-3 are used for the pitch change, you may also select octave-down, normal, or octave-up. *In the demo video, we play reverb over on the initial version. *If you do not have Max, you need to install the Runtime. To download Runtime, click here. Should you have any opinions or wishes concerning our product we will be thankful to hear from you. Please note that technical support can not be provided.